For the first time ever, Shaastra aspires to venture out into a realm yet to be touched by any other tech fest in India. 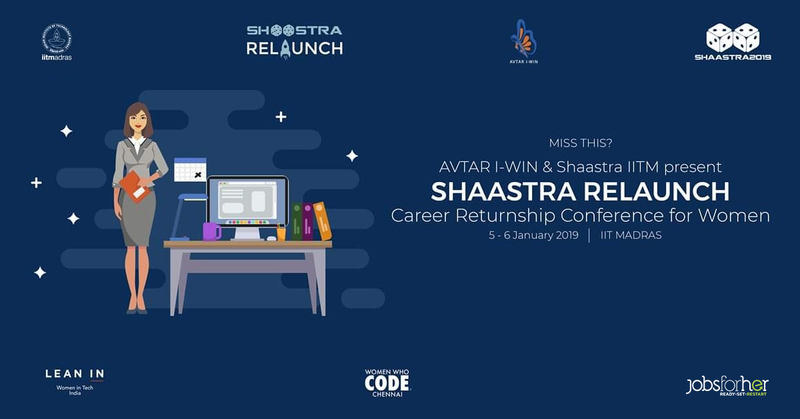 Shaastra Relaunch, is a career relaunch conference for women in the tech and managerial field. Relaunch aims at providing insights to the world of practical knowledge by serving women professionals a platform wherein they learn from lectures and panel discussions, hone their skills by a series of workshops, get mentored by the experienced and network with the right people for a bright future. A skill oriented 2 day event on 5th and 6th January 2019, Relaunch will help women professionals after a sabbatical, to cope up with the fast-changing job market by receiving mentorship and a remarkable opportunity of professional level networking with delegates from world class companies to kick start their second innings. Reskill: Brush up those old skills of yours and let them sparkle so bright, so that they set your career on your favourable track. Let yourselves evolve into cutting edge professionalism with our great lectures, workshops, hand-ons and more. Reconnect: Enhance your connections. As the oft quoted adage goes, “Connection is the key to personal and career success”. So, ascend the flight of stairs to victory by connecting to the right people. Re-establish your lost connection with the professional field and get ready to succeed. Restart: With all the new skill sets, right connections and a whole new ‘YOU’, bootstrap for your second innings. Kick start your new professional life and set yourself to conquer the world. Has taken time off to pursue a passion / vacation, raise children, care for sick / aging, do voluntary services for society, focus on a personal health issue, or other reasons. Wants to overcome hurdles that makes them feel isolated / demotivated. Plans to or is ready to start the next phase of her career journey by scaling new heights. Is interested in associating with other relaunchers. Is eager to learn latest skill development techniques and proven job-search strategies that work in today’s economy. Wants to meet employers interested in hiring relaunchers. Inspiring lectures on the latest cutting-edge developments in the tech and managerial domain. Thought provoking panel discussions on self-development to transcend higher in your career path. Skill building workshops to equip you with a package of necessary skills to take up challenges easily. Mentorship sessions with career coaches to learn, network and get your questions answered. Well organised ‘Corporate Conclave’ to throw light on re-entry internship programs and direct hiring by organisations. The beginnings of a customised returnship plan. Immense encouragement to continue your quest for excellence. Knowledge of the top work and management strategies to be unrivalled in future. A wide network of peer relaunchers seeking brilliance in the ladder of success. Confidence, Perseverance and New Outlook!